The 2017 World Cycling Championships will take place in Bergen 16th - 24th September. This will lead to challenges regarding delivery beginning 10th September (when the routes will be built) and for the rest of September (when the routes will be deconstructed). Bergen city center will be closed during the World Cycling Championships. This will mean that delivery will only be possible 0400-0800hrs (light green area in picture) and 0500-0800hrs (dark green area in picture). We will therefore have reduced distribution during this period and only night deliveries between 1900hrs and 0800hrs (excepting the delivery times mentioned above). 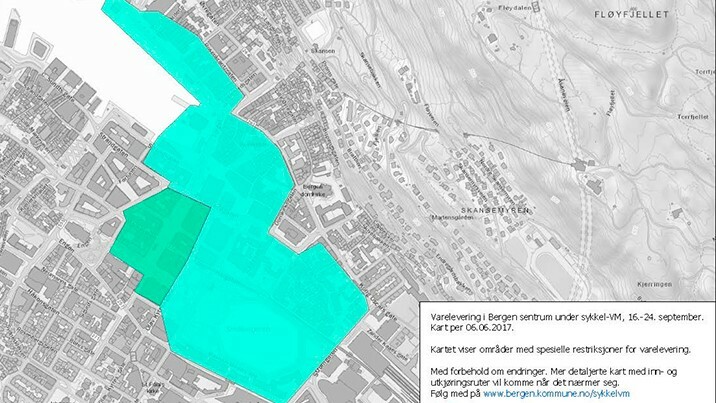 All distribution in the Bergen area will be affected by the World Cycling Championships. Consignees should contact us directly if they have questions regarding distribution in this period. Many of the major roads into Bergen will have narrow driving lanes during the World Cycling Championships, leading to longer delivery times. Please contact us on if you have any questions in this regard.